Do you have some screenshots that show the source of the error? step 3 is going back to fio/tmp malloc calls and fixing above then making sure 7D still lockup free. what else could this be affecting? *had another thought... could those calls actually be freed while recording after ~3 mins? The backend is most likely catching a nasty bug, so don't bypass the backend just because it appears to work. This is not an error that can be safely ignored. The side effects for this kind of error vary from not noticeable in practice, to camera acting like drunk without finding any logical explanation. I've recorded some short WAV clips on 5D2, all seems OK. I'll try to check the 7D next week. I kno... there is a memory leak... either I forgot a free or bypassing it shows beep.c has the leak in general record over 2 mins and look at memory in debug menu... I think part of the problem is small alloc, I don't think its possible to replace it with tmp_malloc. Used fio_malloc/small for the rest and now still freezing, I'm going to try more combos like all fio_malloc/etc. The alloc type is only a hint for choosing the allocator (whether it will it prefer to go into malloc/AllocateMemory/shoot_malloc/whatever). It seems to be choosing malloc tho..
fio_malloc/tmp_malloc - freeze ~2 min. 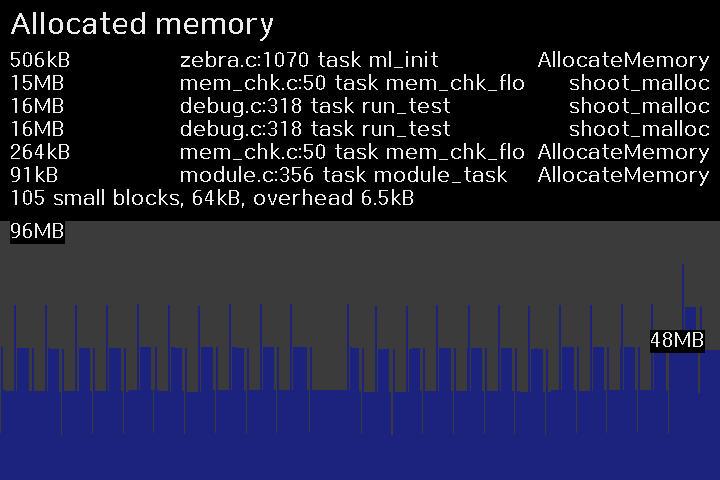 On 6D just fixing dma_memory to fio_malloc appears to fix everything. I think the issue *might* be that it allocates dynamically based on the data its holding, if its too big it allocates it larger and then when it goes to free it may be freeing the wrong thing. Understood. I think we need to rewrite it from scratch, with the method used for burst silent pics (zero CPU overhead) and maybe a buffering algorithm similar to raw_rec (or maybe just double-buffering with a larger buffer should do the trick). This will also remove the need for dma_memcpy. Also I'd like an option to pass the buffers filled with audio data via a CBR (instead of saving to a file), which should make it easy to integrate audio in MLV. Also if you rewrite, everything seems to be working with stereo int 16 sampled as 2 uint8, both channels are recorded. the mono 8 was just in terms of quality and inability to do internal L, ext R, etc. One rather nice thing, write the header at the end so you have real lenght. Real length is possible now, since we have a file seek function. Back then we didn't. For double free, I think I found the bug: if you look at add_write_q and write_q_dump, the latter is allowed to save a queue that was not yet filled completely. When this happens, that buffer is saved (and freed) twice. 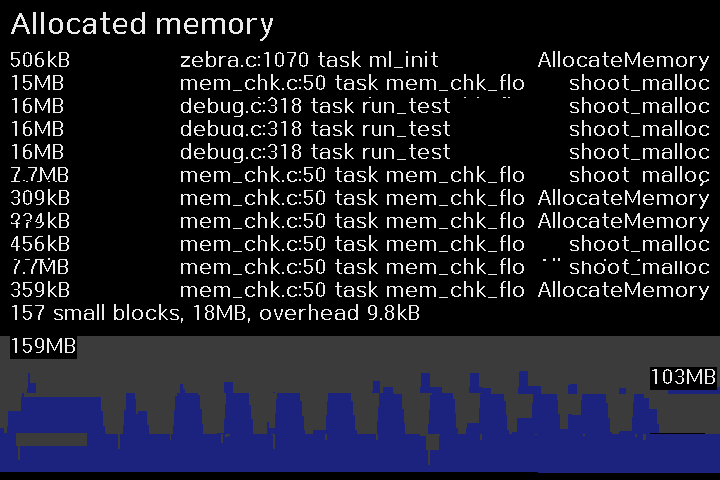 It's not a bug in the memory backend, but in the wav recording code. At a closer look, the bug is severe (the recording task will write on deallocated memory, so you can expect any kind of side effects), so I'll disable this feature until a solution is found. Yeah, my bad for accepting code without fully understanding how it works. What about static allocation of the buffer and only free when recording is finished? understanding the code? thats rarely possible in reality. static allocation? yep. allocation on recording, free on finishing. My old implementation had just two buffers and no memcpy (but I think it did file I/O from the CBR). I'm thinking to try it again. It looks like it uses 3*~200KB or so. Otherwise maybe do it like silent pics but using allocate mem instead of shoot malloc. On 700D the stub for GetMemoryInformation = 0x7498 so according to my IDA am I right that the GetSizeofMaxRegion = 0x7444??? Yep. Easy to find, just time-consuming. Suggestion: you can load an additional binary in IDA at the ram functions address space. It will make your life much easier.